Shreyas Gopal produced one of the best bowling spells of his T20 career – a spell which tormented and bamboozled the RCB top-order and helped the Royals to restrict them to a manageable total. The batsmen then finished the job effectively to give RR a much needed win – their first of the season. Gopal returned with figures of 3-12 off his quota of 4 overs and impressed with the variations in his googlies. Virat Kohli and Parthiv Patel had given RCB an excellent start – they had moved to 48 without the loss of a wicket at the end of the powerplay. The platform had been laid for a big total. Parthiv was playing the aggressor while Kohli dropped anchor and looked determined to bat through the innings. Gopal was introduced in the 7th over. He had a plan to Kohli and immediately attacked him with the googly – this was smart thinking by the leggie as the Indian captain has shown a weakness against the wrong’un of late - Gopal almost had Kohli off his second ball but for an inside edge. He followed that with another googly – slightly wider and slower inducing the drive from the RCB captain only to leave a big gap between bat and pad and see his wickets castled. Gopal had cleaned him up with an absolute peach. Parthiv and AB de Villiers counter attacked Varun Aaron and took him for 16. At the end of 8 overs, RCB had raced to 71 and there was plenty of firepower left to still get a huge total. But Gopal had other ideas. He made the googly his stock delivery for the evening. He forced AB de Villiers to play a false shot – again of a wrong’un that also kept low – the South African perishing by giving an easy caught and bowled back to the bowler. Gopal had sent back Kohli and AB – unarguably the two greatest batsmen of their generation – back to the pavilion in two successive overs. 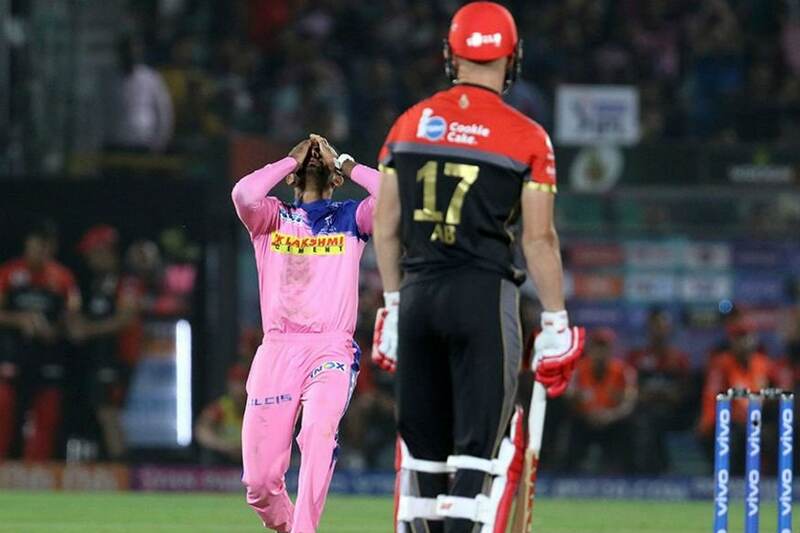 Incidently, this was the second time he had dismissed the duo in an IPL match – the previous being in Bengaluru in 2018. Shimron Hetymer looked all at sea against the barrage of googlies from Gopal who also slipped in the odd leg-break. He looked uncomfortable and was not reading the spin off the bowler’s hand. With the ball also stopping and gripping, Gopal looked menacing with every delivery he bowled. He flummoxed Hetymer with yet another googly, inducing an outside edge to the keeper, Jos Buttler. The West Indian departed for a pain-staking 1 off 9 deliveries. Gopal had turned the match on its head in his 3 overs. He had picked three big wickets and conceded just 8 runs in this spell. He was brilliantly restrictive and bowled as many as 14 dot balls including a maiden! RCB, from 48 for no loss after the powerplay, were reduced to 74 for 3 after 11 overs. Gopal returned to bowl the 15th over of the innings. Parthiv and Marcus Stoinis were on the attack and had taken 12 (off Ben Stokes) and 11 (off Jofra Archer). But all they could muster off the leggie were 4 singles. Gopal finished a magnificent spell – a spell in which he bowled as many as 13 googlies and got the better of the best three RCB batsmen and was also phenomenally restrictive. He bowled as many as 16 dot balls in his quota of 4 overs and went for just one boundary – that is how good he was! Gopal has been a wicket-taker and a strike bowler in the limited opportunities he has got in the IPL. He has picked 24 wickets in just 21 matches at an impressive average of 19.04 and strike rate of 15.5. He has also been very restrictive with an economy of just 7.35 – quite outstanding for a leg-break/googly bowler. He had a good season for RR last year when he picked 11 wickets in 10 innings at a rate of 16.9 balls per wicket. Gopal also has an excellent overall T20 record having picked 42 wickets in 35 innings at 17.42 apiece at a strike rate of just 14.4. He has been extremely restrictive too with an economy rate of 7.25.